The U.S. bank prime rate remained at 3.25 percent. After there were increases in consumer credit card rates in two of the previous three surveys, the latest semi-monthly survey saw a decrease in consumer rewards credit card rates. Inflation has virtually disappeared over the past four months. Interest rates typically represent a premium over inflation, so when the underlying inflation rate drops, it leaves room for interest rates to drop as well. Default rates on bank cards have dropped steadily. These default rates peaked in April 2010, and have continued to come down ever since. They are now less than a third of their peak level. In setting interest rates, credit card companies have to make an allowance for customer defaults, which are a cost to the credit card issuer. When credit card defaults start to fall, card issuers incur fewer of these costs and thus could afford to lower rates -- if they believe the trend will continue. In contrast with the direction suggested by the above trends, with the economy strengthening and the Federal Reserve easing off on its stimulative measures, there has been a general expectation that interest rates are primed to rise. Perhaps that is why credit card rates have not responded to the inflation and default rate trends described above. In particular, with regulatory changes in recent years making it harder for credit card companies to raise rates, decision-makers at those companies may feel it is prudent to maintain a cushion of safety against the possibility of rising rates. What is important for consumers to remember is that different credit card companies will read and respond to these trends in different ways. That is why regular rate shopping is important for people who want to make sure they are getting the lowest rates available. Though it was the result of a change in a different credit card offer than the one that changed in the last survey, the change in rates that occurred in the second half of November perfectly counteracted the change that occurred in the first half. It lowered the average rate on rewards credit cards to its October-ending level of 17.87 percent, and the overall average for consumer credit cards to the October-ending level of 17.17 percent. In doing so, this change reduced the gap between average rewards and non-rewards rates to its prior level of 2.31 percent. There were no rate changes in student credit cards over the latter half of November. 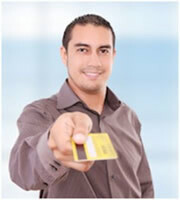 There were no rate changes in business non-rewards or rewards credit cards over the last two weeks of November. For the second consecutive survey, the gap between the average credit card rate offered to customers with excellent credit and the overall average widened, this time by 3 basis points to 4.06 percent. The widening of this spread for two surveys in a row suggests that credit card companies are becoming more cautious about extending credit to people with less-than-perfect payment histories. This development seems somewhat contrary in an environment that has seen a steady decline in default rates, but it is a reminder there is a potential price to be paid for any flaws in a consumer's credit history. 0 Responses to "Consumer rewards rates dip as inflation and defaults ease"